Contact sports contributed to nearly half (45%) of the SRR-TBI visits examined. Males and children aged 10-14 and 15-17 years were most likely to sustain a SRR-TBI. Activities with the highest number of SRR-TBI visits included: football, bicycling, basketball, playground activities, and soccer. Limiting player-to-player collisions through rule changes. Teaching strategies to reduce opportunities for head impacts. 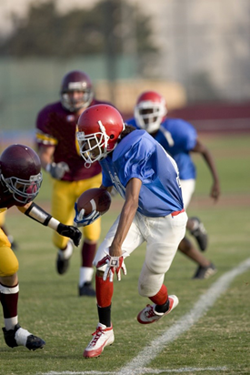 Using pre-participation athletic examinations to identify athletes at increased risk for TBI.